All of your September boxes are officially on their way to our lovely members and this one feels extra special. September marks our Book Box Club birthday. 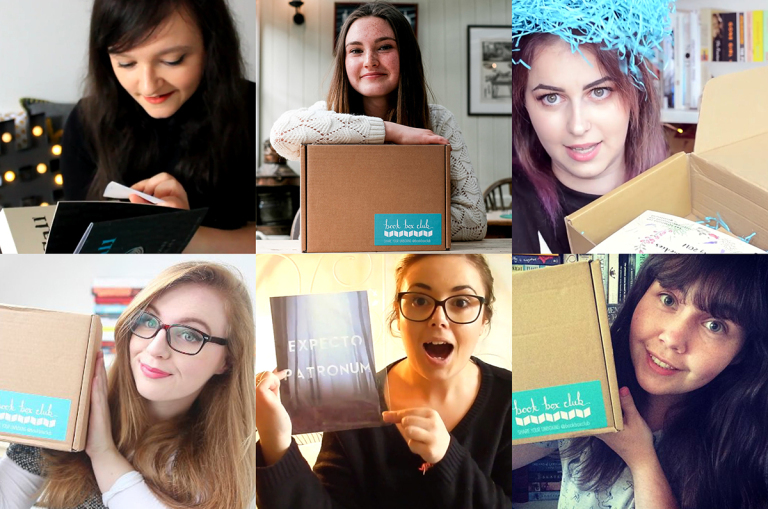 That’s right – here at Book Box Club we have been sending out unashamedly bookish boxes for one whole year and that’s got us thinking about all the amazing memories we’ve made in the last 12 months! Kate and I met selling books in a cosy independent bookshop back in 2010. We became inseparable bookish buddies who spent our evenings talking books, baking bad cookies, swimming blindly side-by-side (no contact lenses in the pool!) and singing pop ballads together. Libby: I know what you mean. We need to shake things up. Kate: I feel as though I’d like to sail around the world, you know? Really achieve something big. Needless to say, we didn’t end up sailing around the world (luckily)! We did, however, do something life changing. We embarked on a journey which would turn out to be just as rewarding, just as adrenaline-fuelled, but with fewer sharks and less seasickness. 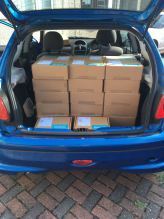 Taking our first ever Enchanted Forest boxes to the post office in my tiny Peugeot. A big thanks to my local postie who had to put up with the many boxes that descended on his tiny desk in the early days. Now we are working on a bigger scale and a lovely man in a van comes to pick them up for us. Less drama and heavy lifting all round! Filming theme reveal trailers has always been a highlight. In the early days we would plan and film each one based on the theme (with a tiny time window in which to do it). This mad method saw us filming through the night in bizarre locations including one long night in a warehouse filming our Freedom Squad trailer. I had too much sugar, false eyelashes that I wasn’t used to wearing, and the giggles which resulted in us having to retake each shot 100+ times – also there was definitely no toilet in the vicinity. Good times! 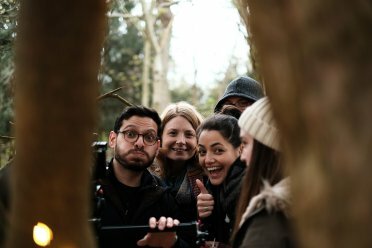 We then decided we would all take a trip to the beautiful Suffolk countryside to film a batch of trailers at once with the help of our beautiful model (and Kate’s cousin) Sophie, who put up with freezing temperatures and a rigorous filming schedule whilst still managing to make all the rest of us laugh. What a trooper! We also had the help of my lovely talented filmmaker boyfriend Hakan and his photographer brother Tarik, who were so patient when the rest of us were messing around and created trailers and photos that we are so proud to post. We’ve also had some downright hilarious conversations about the names of our favourite ships, what we would do if were facing a nightmare faerie world as in our first featured read The Call by Peadar O’Guilin (by the way the consensus was probably die! ), and the reason why Kate and I are constantly being censored by our over zealous safe-guarding system (we aren’t sweary – honest!). If you haven’t yet made it to one of our book groups you should definitely come and hang out with us in The Clubhouse, it’s so fun! y first chapter of an ARC and you know it’s going to make an amazing featured read is the best. I don’t think I could pick a favourite but we would love to hear some of yourWorking alongside so many amazing crafters to create some beautiful box items. Shout out to all of our lovely crafty comrades, from our very first box where we teamed up with the wonderful Mariam from Oh Panda Eyes who has been so supportive and inspiring ever since, to our recent collaborations with one of our founding member besties Moon Kestrel. We love that we get the chance to help develop exclusive items and throw ideas around with people who really know their craft – we are just in the process of creating something great with the lovely FourSeasonsFox for our October box and we just know it’s going to be beautiful. Meeting so many friendly faces at YALC! 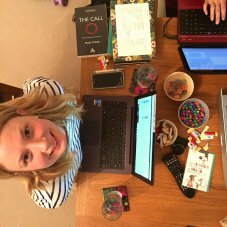 Back in July this year we headed to London’s Young Adult Literary Conference and had a blast putting some faces to usernames and making new friends as we chatted books with so many people. Watching Hermione and Little Red Riding Hood prepare for a waltzing competition has to be a surreal, but hilarious highlight. Having a Purely Books brainwave on a long countryside walk. Kate and I have most of our most productive brainstorming sessions whilst walking through the countryside and this one was on a particularly sunny spring day. Purely Books was inspired by some feedback we had had from some customers who were super excited to join in our book group meetings but were less inclined to collect all the bookish merch – thanks to those constructive comments we can now open our Clubhouse doors to lots more people. On that day we high-fived and went home to drink Pimms in the garden and now a few months down the line Purely Books (all the great reads without the goodies) is now a growing club of its own! Thank you to all of our lovely members- we couldn’t have done it without you. We’d love to hear about your favourite Book Box Club memories so far in the comments below or over on our social media channels. Here’s to many more adventures to come!